EatingWell is an in-print magazine but it also offers a wide range of online recipes and a few tools to help you eat healthily and lose weight. You can find recipes, menus, tips on cooking and more, including a selection of videos. The magazine itself is very affordable, and allows you to access a hard copy of selected recipes and articles. This might be useful if you want to follow recipes without taking your computer to the kitchen with you, although you could – of course – simply print them out. The online service offers a lot more, however, and it’s worth looking at what’s provided. First off, it’s important to note that this site is free to use. As such it will probably be a useful resource for anyone looking to lose weight, although it does focus more on “healthy eating” rather than “weight loss.” This means that you do need to be a bit careful about following its plans to lose weight, as you could potentially over eat. That said, the recipes on EatingWell.com are generally very healthy, and you can also complete a brief quiz which lets the system know how many calories you wish to eat per day. From there, Eating Well suggests a range of meals or meal plans which you can try, all within your calorie limit. Unfortunately you can’t easily switch foods in and out of the plan , and you cannot change quantities. This essentially means that you only really know what you’re eating (calorie and nutrition-wise) if you stick quite religiously to the plan you’re provided with. We were interested by the videos available on this site, as you can see how foods are made, where ingredients are from, what people have to say about meals and more. It adds a bit of excitement to the process, as well as just offering a bit of different media to absorb. This site also offers information on how to cook healthily, which is good to see as it’s sometimes just assumed that we’re all great chefs. However it’s lacking any exercise information, and aside from the blogs (where you can leave comments), there are no community features. 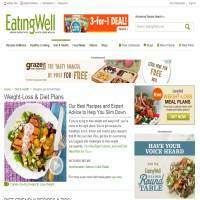 Everything considered, we felt that EatingWell.com was a really useful resource, particularly for tasty recipes. Whilst its food planner isn’t as adaptable as we’d like, it’s still useful if you can’t find one that you like elsewhere. You can print recipes, or check them on your mobile device, which makes it a fairly versatile healthy eating website. It’s worth looking at the “weight loss” section in particular, and seeing which recipes it recommends based on your weight loss targets.